If anything, 2010 is my year to watch all the big trilogies (let's see...LOTR, Back to the Future, Bourne...oh and I plan to watch the Ocean's movies too). Sometimes I find the second film to be the weakest of the lot. That theory is clearly evident in The Bourne Supremacy, as it is pretty much the same as the first one, which is kinda boring. However, it's not all that bad. After escaping from the emotional and physical pain he previously encountered, Jason Bourne (Matt Damon) and his girlfriend Marie (Franka Pontente) begin a new life as far away as possible. But when an assassination attempt on Bourne goes horribly wrong, Bourne must re-enter the life he wanted to leave behind, in order to find out the truth why they are still after him. While this movie, for me, wasn't as good as the first one, it still has many merits which are very similar to the first. It is as explosive and full on action as the first. However, on it's own, it portrays a much darker and more intelligent view of Jason Bourne and the mess he has found himself in. Now we know a bit about Bourne, this has allowed the story to let Bourne delve into some strange situations and try to dig himself out without seeming too over the top. Again, this movie is clever and inventive, putting a new spin on the 'spy' character. It's easy to enjoy this movie, but I imagine that guys would probably revel in it because this is definitely more a movie for guys, rather than the teenage girl that I am. Matt Damon, once again, achieves a high action hero status with this, and passes as one of the better action heroes that doesn't succumb to cheesiness or become unbelievable. That, to me, is the films best asset. 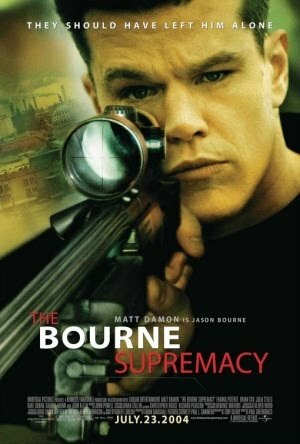 A great sequel, I'm definitely amped to watch The Bourne Ultimatum. I agree with your review, while liking Supremacy, I thought is was the weakest one of the series. Don't worry, the third one goes out with a bang.It's awesome.